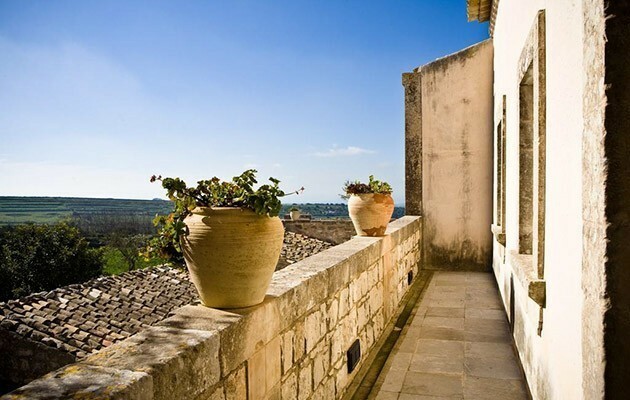 Eremo della Giubiliana is an historic country house situated south of Ragusa, surrounded by the lush countryside of the Ibleo plateau and its carob trees forest. 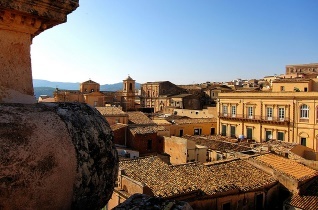 Located in a strategic position at the centre of eastern Sicily, it’s the ideal base for those who want to discover the region, visiting Taormina, Siracusa, Agrigento and the UNESCO Val di Noto Baroque sites. 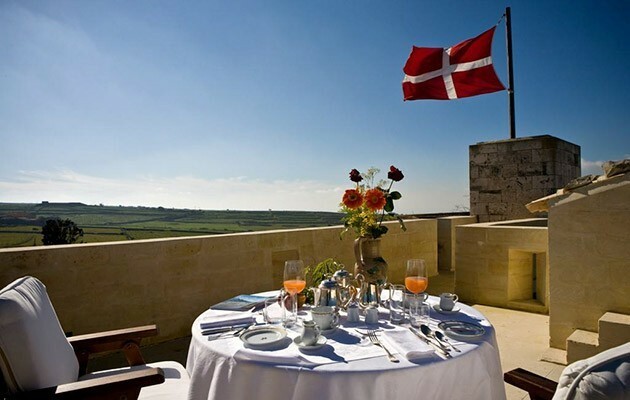 Historic residence with thick white stone walls, its large tower dominates the plateau and the beautiful opposite landscape: on a clear and nice day you can catch a glimpse of Malta island and of the African coast. Completely restored fully respecting the original materials (such as the ancient pitchstone and limestone floor) and furnishings, Eremo della Giubiliana still saves the old handmade furniture, the precious fabrics and rare maps, as well as the original painting of the seventeenth century representing the Virgin Mary. 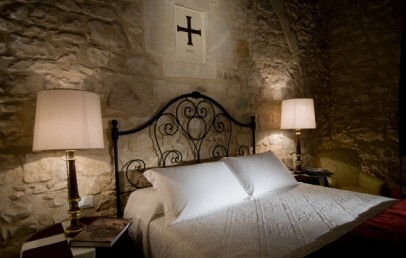 L’Eremo della Giubiliana has 12 rooms, 4 Suites and Cottages, obtained from the ancient monk’s cells, furnished with old furniture and embellished with original Sicilian family ornaments, soft sofas and valuable carpets. 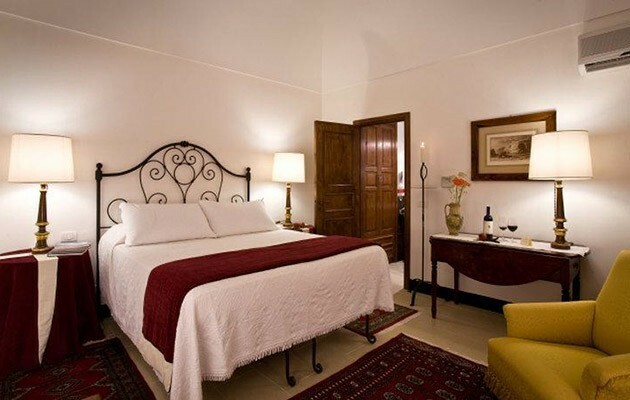 The rooms, which reveal the refined typical Sicilian hospitality style, are equipped with every comfort: satellite TV Lcd, air conditioning and private bathrooms. 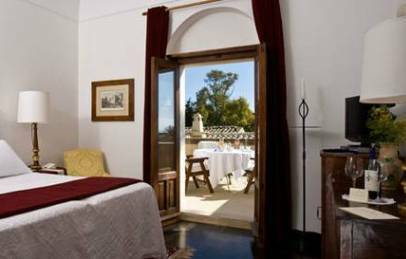 The double rooms Classic and Superior overlook the “Orto degli aromi”, a fragrant garden with aromatic and Mediterranean herbs, age-old olive trees as well as an ancient Arab fountain; some of them are located on the ground floor and have disabled access. 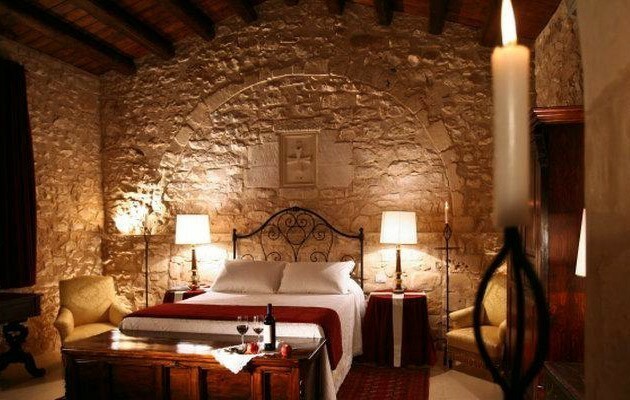 All rooms are unique and different from each other, with wrought-iron beds, private bathroom and original pitchstone floors. In some Superior rooms it is possible, on request, to add a third bed. The Deluxe are located respectively in the east and the north wings of the upper floor, the 2 Deluxe rooms dispose of a private terrace and a large bathroom with a tub with massage function. The nice and different Suite have in in common the typical elegance and charm that can be breathed in the whole structure; each of them has specific characteristics in terms of location, the structure of the room and its furnishings, which make them unique and different from the others. The Cottages are located at 400 m distance from the main building with private garden and veranda and offer the same services as the rooms, except the room service. 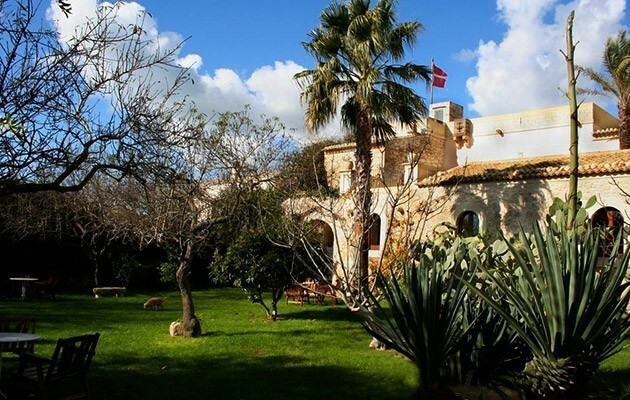 The massage zone Asphodelus is located just opposite the archaeological site; here guests can take care of themselves with several treatments, sipping herbal tea and relaxing amongst the ancient olive trees in the park. 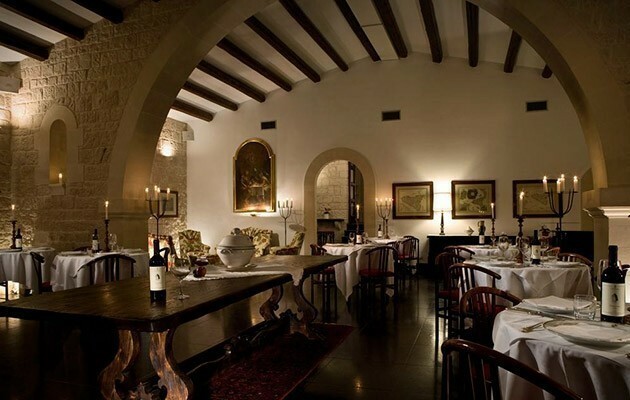 Don Eusebio Restaurant is housed in a large hall in the ancient refectory used by the Knights of the Order of Saint John. 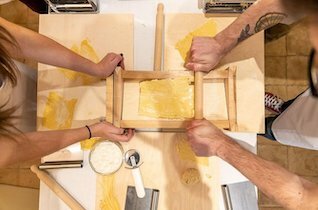 L’Eremo della Giubiliana offers its guests an extraordinary culinary experience at Don Eusebio Restaurant run by a talented Chef. 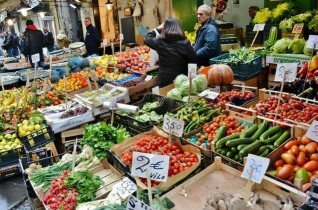 He skillfully blends age-old recipes of the Hyblean aristocracy, based on local and seasonal products. 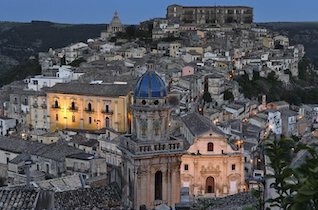 The best Sicilian wines can be tasted directly in the cellar of the crypt, as the culmination of this wine and food tour in this flavour-rich land. The tea room is even more fascinating thanks to the antique and rare maps collection, representing Sicily from to the fifteenth to the eighteenth century; the bright windows overlooks the ancient olive trees of the park as well as Malta islands. Eremo della Giubiliana offers a private airstrip consisting of two runways without landing fees nor handling, and free parking for Eremo guests. 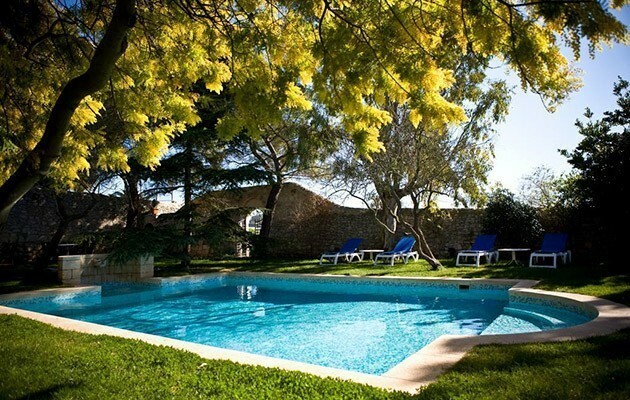 A swimming pool and a beach establishment with special agreement (in 12 km distance) are at the disposal of the guests who want to relax and enjoy the hot Sicilian sun. 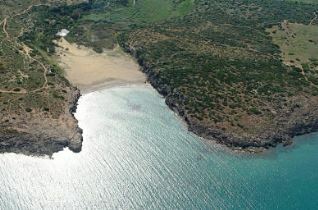 The Golf Club Donnafugata is at 25 km distance. 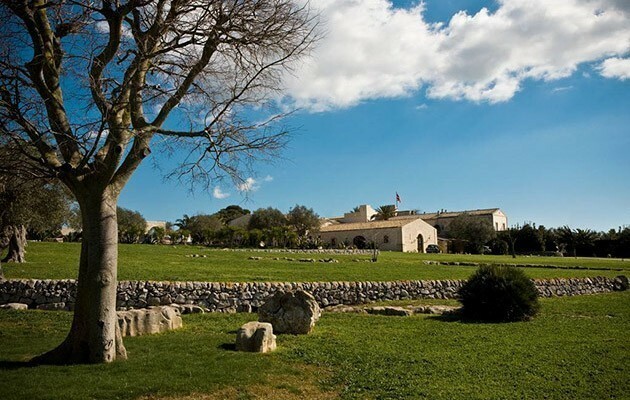 Worthy of note is the archaeological site located inside the estate: a necropolis whose origins are estimated between the fifth and third century BC, located in the northern part of the park. 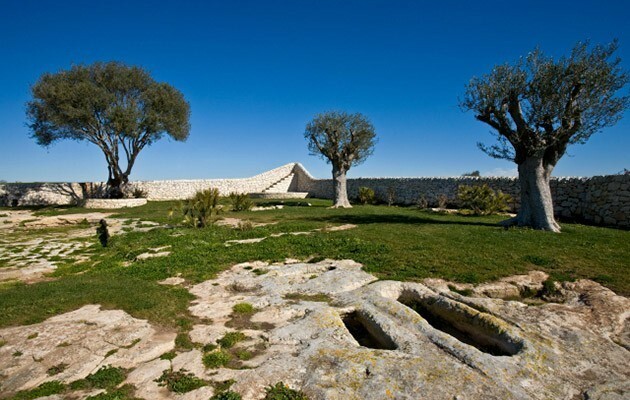 The area, which has been arranged to be an archaeological park, will soon open for guests who wish to visit it. Animal lovers will be pleased to know that the hotel with pleasure welcomes their four-legged friends, letting them free to enjoy the garden and the park as well as the entire estate; the treatment will be half-board à la carte or according to different indications of the pet’s owner. 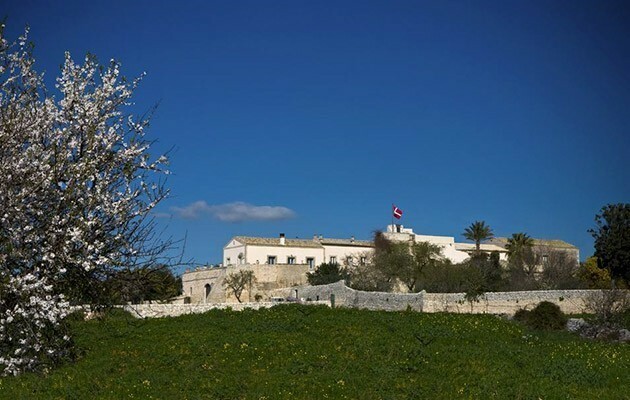 Tourist Tax – the municipality of Ragusa requires the payment of Euro 2,50 per person per overnight for the first 7 consecutive overnights. Children under 12 years are exempted. This tax has to be paid on spot and is required from mid March to end October and mid December to mid January. 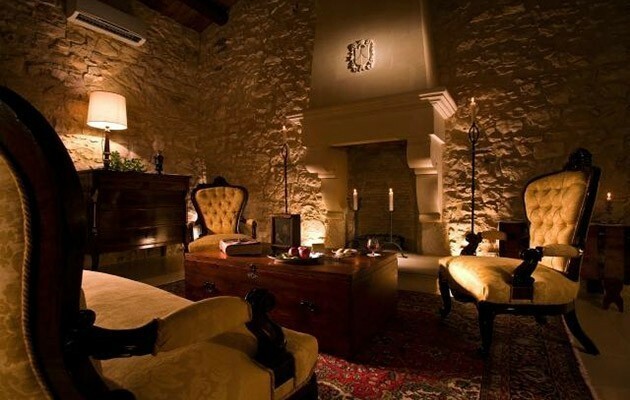 Exclusive Suite dedicated to the Doctor and Canon Ignazio Nifosì. 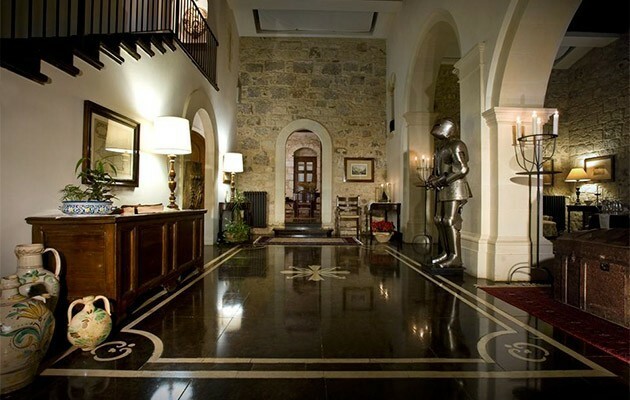 The Suite was a tower of the XV century and consists of 3 floors. 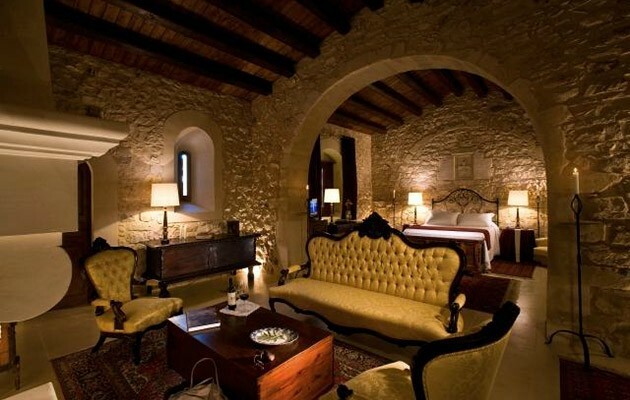 The double room, placed on the 1st floor, is characterized by fascinating vaults and capitals of the XV century. It overlooks the private garden and the “Corte Araba”. On the ground floor there is the living room with old furniture, private books and utilities of the Canon. The private bathroom is equipped with tub with shower, bathrobes and hairdryer. 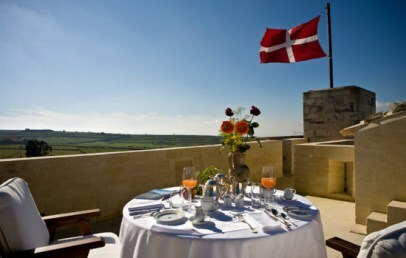 The Superior Suite presents a 2nd terrace with Altopiano, coast and Malta Islands view. 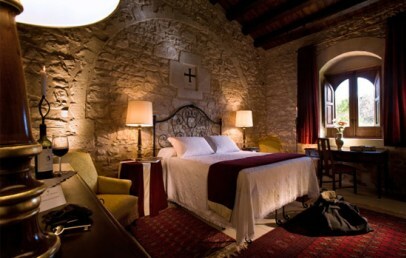 Originally it was the old guard of the Eremo for this reason the suite is called "Della Guardia". 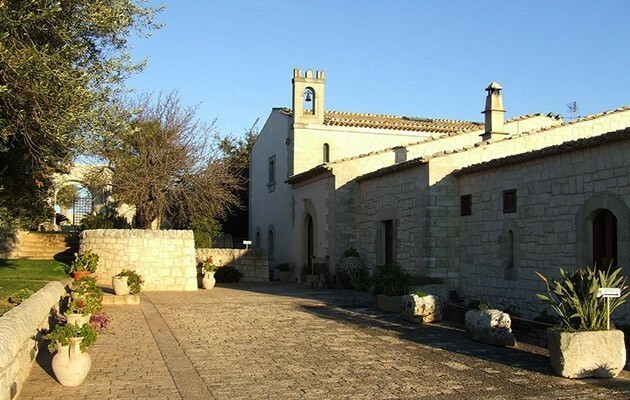 It consists of one large ground floor characterized by white stoned walls and floor, high ceiling with chestnut-wooden beams and a stone arch. 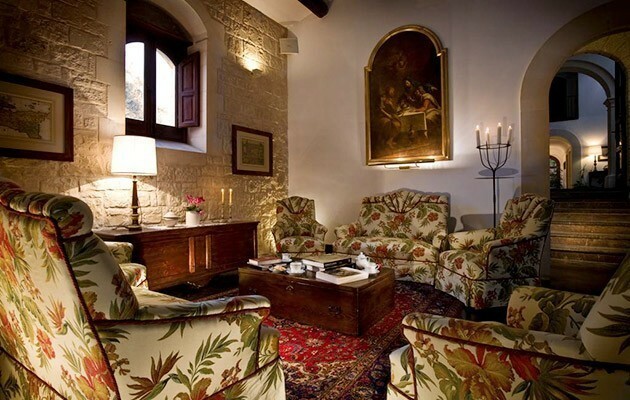 The living area has an old stone fireplace and a wonderful sofa of the XVIII century with damask tapestry. 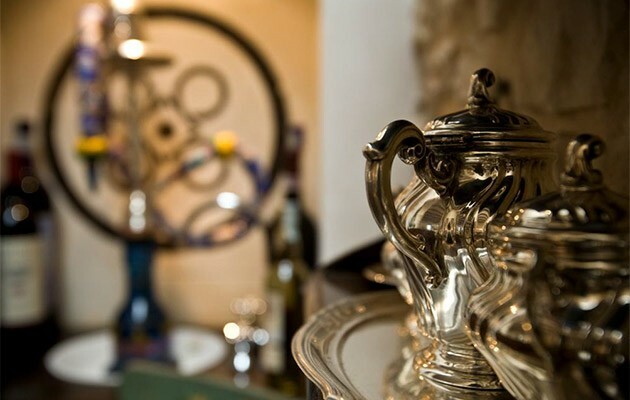 It is furnished with big drawers and chests of the XVII century, old oriental carpets and antique furnishings. A little medieval door leads you to the bathroom overlooking the garden; it has two sinks, a whirlpool, bathrobes and hairdryer. 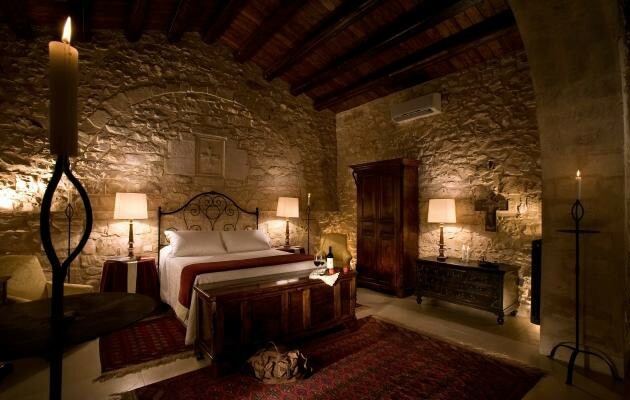 The double room is located in the 1st floor of an ancient structure divided on 2 levels. Connected through a staircase with the original 18th-century chestnut wood balustrade, it present a wrought iron bed, ancient furniture and details. On the ground floor there is the living room dominated by a 18th century sacristy-vestry. This Suite, particularly indicated for families with children, is connected to another double room with toilet. The bathroom is upper stairs and has a bathtub, bathrobes and hairdryer. 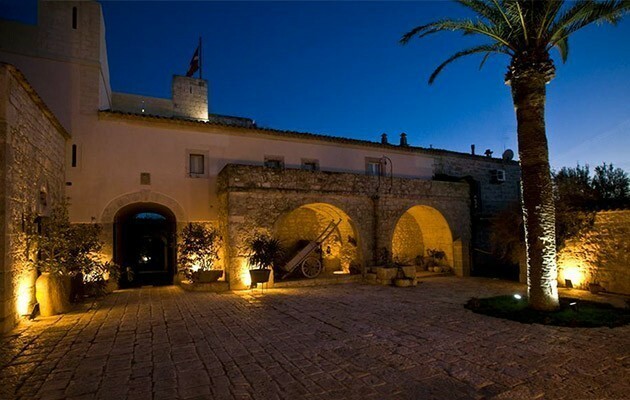 The accommodation overlooks the stone courtyard dominated by a large palm tree. 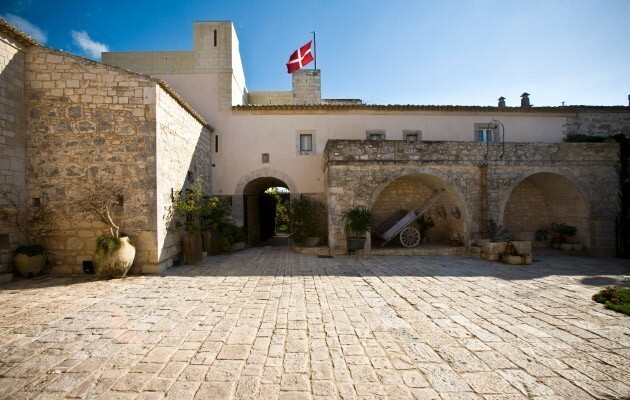 Dedicated to the Malta monk-knights, it is characterized by thick stone walls and white stoned pavement. 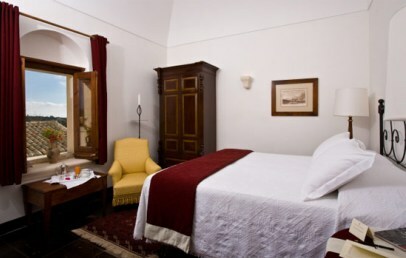 It consists of an open space: the double room equipped with Wrought iron bed, antique furniture, an original Modica chests of the XVII century, old Persian carpets and damask arm-chairs. The main detail of this Suite is a black cross engraved on the white stoned wall. The bathroom has a tub with massage jets, bathrobes and hairdryer. The Superior Frate Nero Suite face the garden. 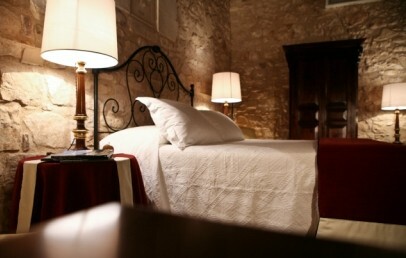 Double room with wrought iron bed, located in the ground or 1st floor of the hotel. 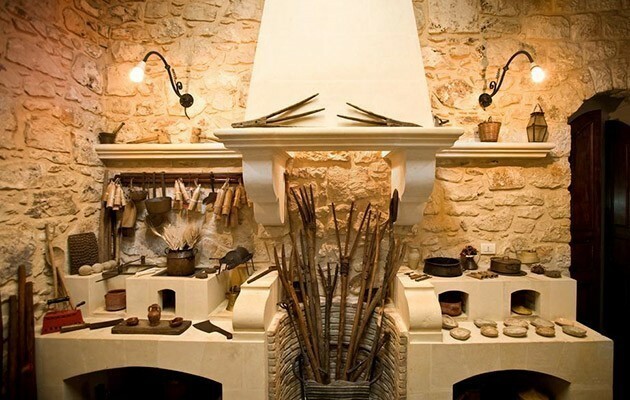 They are cosy and bright and have old and original furniture as well as a pitch stone flooring. The private bathroom has a tub with shower, bathrobes and hairdryer. Most of the Classic rooms face the flourishing garden. Large double room with wrought iron bed and 3rd bed on request. Located in the ground or 1st floor of the hotel and have old and original furniture as well as an original pitch stone flooring. The private bathroom has a tub with shower, bathrobes and hairdryer. 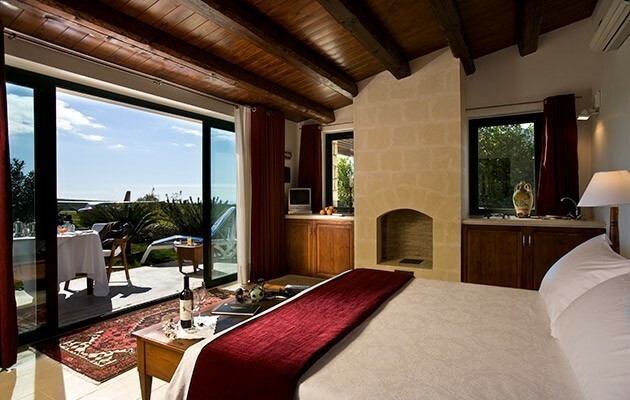 Most of the Superior rooms face the flourishing garden. Elegant and intimate double rooms, located respectively in the east and the north wings on the upper part. 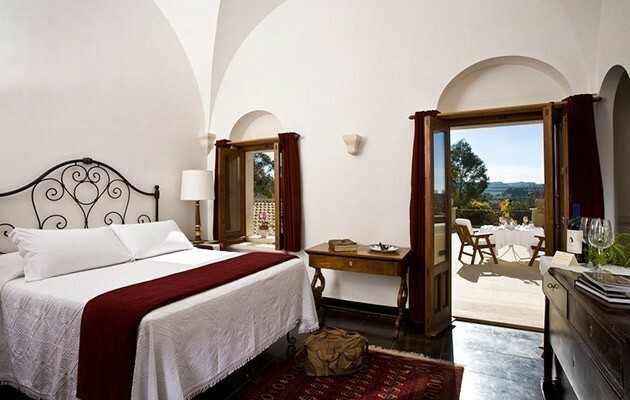 They are characterized by high vaults, original pitch stone floorings, old furnishings and oriental carpets. The private bathroom is bright and equipped with whirlpool, bathrobes and hairdryer. 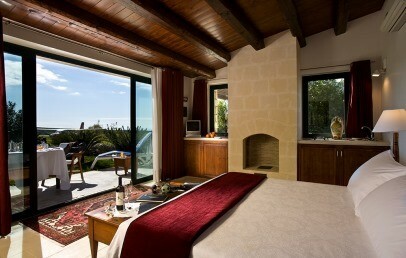 The "Corte Araba" Deluxe room has a large terrace with garden and panoramic se view. 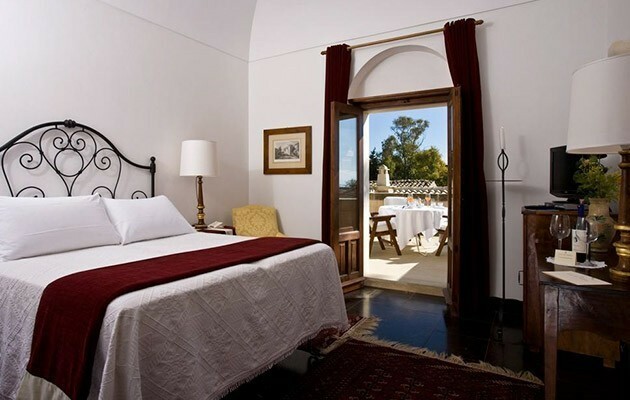 The "dell’Alcova" Deluxe room faces a spacious terrace with chairs and a table and overlooks the archaeological park and the Antiquarium. 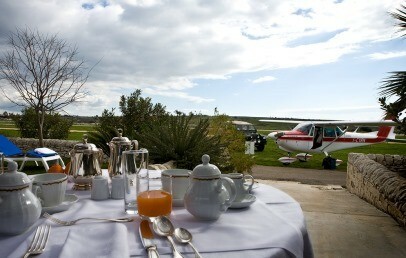 Located at 400 m from the main house, along the private airstrip. From the cottages you can enjoy a fantastic view over the highland Ibleo. 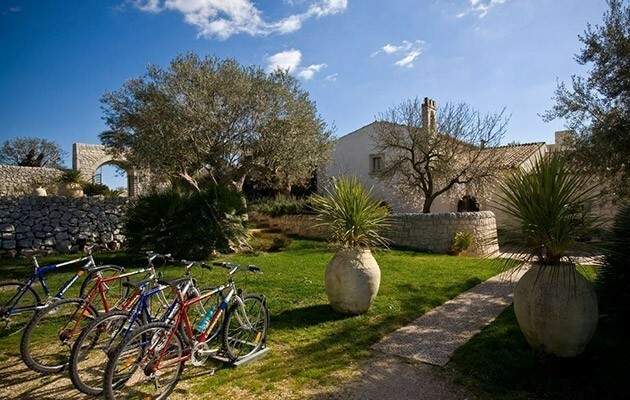 The cottages are designed as the old shepherd houses with all fenced with typical small stone walls, own parking place, private garden and veranda. 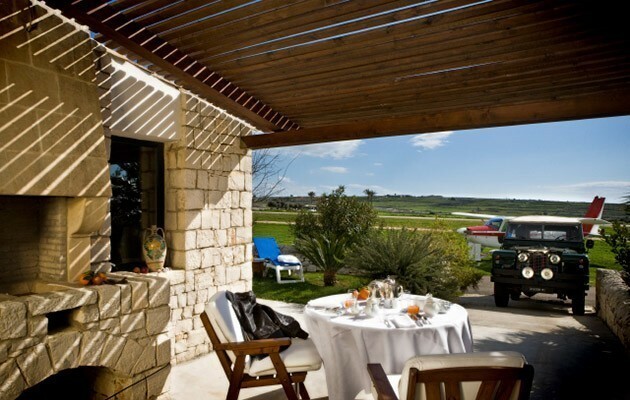 The interiors are finished with white stone floorings, exposed beam ceilings, minibar and air conditioning. The bathrooms have a large bathtub with window overlooking the garden. The cottages have the same services as the rooms in the main building except of the room service.